Although tiny in size at just 70 square miles, Aruba has huge appeal when it comes to a special getaway. Blessed with ample sunshine and some of the world's finest beaches, plus an array of sun-drenched luxury resorts and a never-ending activities list (both on land and in the water), the island is a tried and true honeymoon destination. 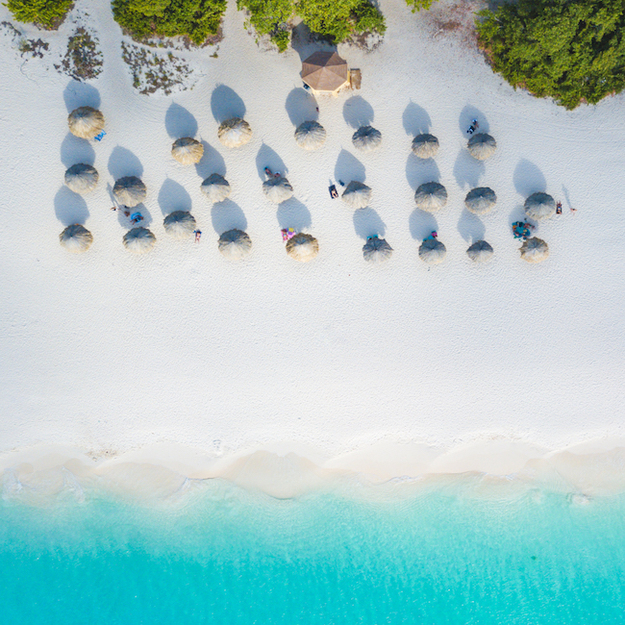 Read on to discover our favorite way to spend four days on "One Happy Island," a true slice of paradise in the southern Caribbean. 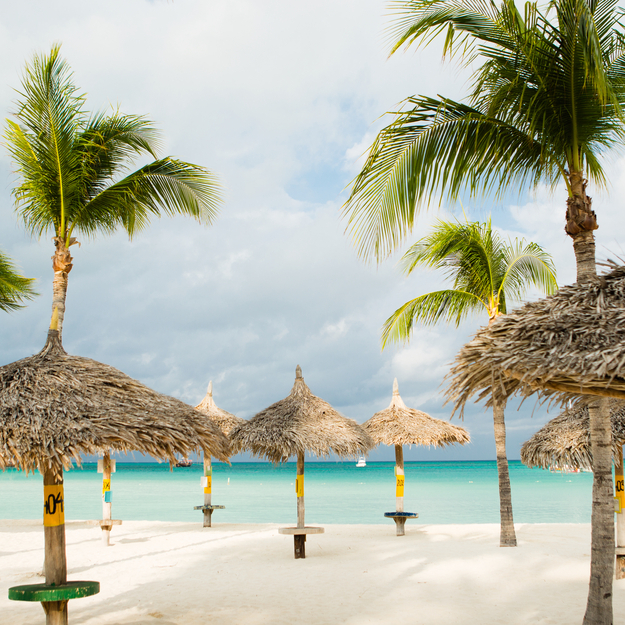 Drop your bags at Aruba Marriott Resort & Stellaris Casino, conveniently situated along the soft white sands of Palm Beach on the island's northwestern coast. This highly-acclaimed property boasts 414 spacious rooms, 10 dining and bar options, two spectacular pools (including a swim-up pool bar), and extensive amenities like water sports activities, the island's largest casino, and an exceptional spa. It's also home to The Tradewinds Club, an exclusive adults-only boutique hotel experience. Highlights of this unique program include a private lounge with five complimentary food and beverage offerings daily, a personal concierge, a private beach area, and much more. Once you unpack your suitcase and settle in, head straight to the outdoor pool for some much needed rest and relaxation. After taking a dip beneath the massive waterfall, head over to the pool's swim-up bar for a rum punch or piña colada. For your first dining experience, book a table just before sunset at Atardi, one of the island's best restaurants. After checking in with the host, you'll immediately kick off your shoes and proceed to your candle-lit table nestled in the soft sand of Palm Beach. As your feet dangle in the powdery sand, prepare for a stunning view of the day's sunset. Once the sun dips below the horizon, get ready for inventive seafood cuisine (do try the macadamia-crusted grouper) and a magical atmosphere. From the beach, make your way inside to The Lobby for a perfectly poured cocktail and live music. Led by an expert team of mixologists, this stylish, modern bar recently launched a new craft cocktail menu with creative libations like the Peach Break, Citrus Martini, and Smoking Old Fashioned. Fuel up for an adventurous day with a mouth-watering American breakfast or brunch buffet out on the lush terrace at La Vista restaurant. You'll be treated to gorgeous views of the Caribbean Sea plus signature palapas that dot the sugary white sands of Palm Beach. Next, head down to De Palm Pier before boarding a 70-foot-long catamaran for a morning snorkel sail with De Palm Tours. Once aboard, you'll venture out to three prime snorkeling locales along Aruba's leeward coast, including a historic shipwreck. The half-day cruise includes an open bar, festive music, and a delicious lunch. After an action-packed morning, it's time to relax and rejuvenate the body at Mandara Spa, located at Marriott Ocean Club. This Balinese-themed sanctuary has 12 treatment rooms, saunas, salon services, a relaxation lounge, and four spacious couples treatment rooms. Popular treatments include the Aloe & Milk Bath Wrap, the Fire & Ice Massage (which uses hot stones and ice-cool gels), and the Massage De La Aruba (which is a traditional massage of Aruba passed down through generations). Later in the evening, head out for a poolside alfresco dinner at Papiamento Restaurant. The award-winning restaurant is set within a 126-year-old house complete with European antiques, lush gardens, a sparkling pool, and twinkling lights scattered throughout trees. The innovative menu infuses a lot of traditional Aruban recipes and flavors in dishes like Aruban Oyster Chowder and Champagne Casserole. Cap the night by trying your luck at Stellaris Casino, located at Aruba Marriott Resort. The popular casino is the largest on the island and features over 500 state-of-the-art slots, 32 gaming tables, and more. 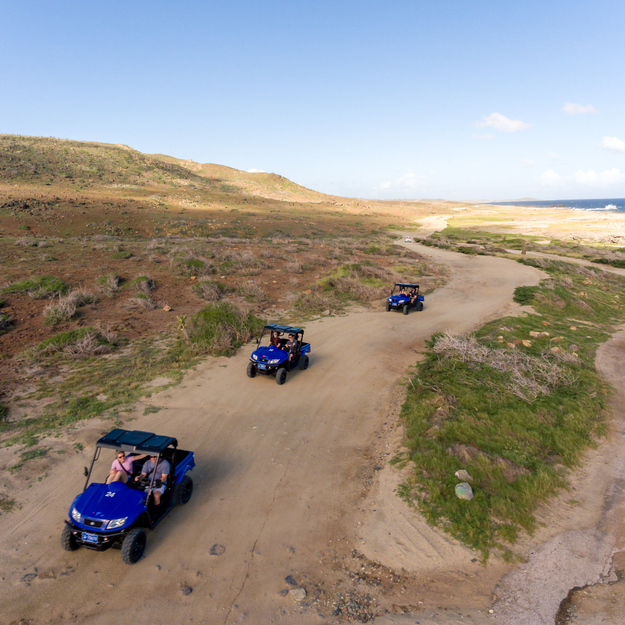 After an exciting day spent in the water, it's now time for some action on the land by joining a morning UTV off-road adventure through De Palm Tours. This thrilling excursion will have you behind the wheel of a unique UTV 4x4 vehicle for a tour of the desert landscape found in nearby Arikok National Park. 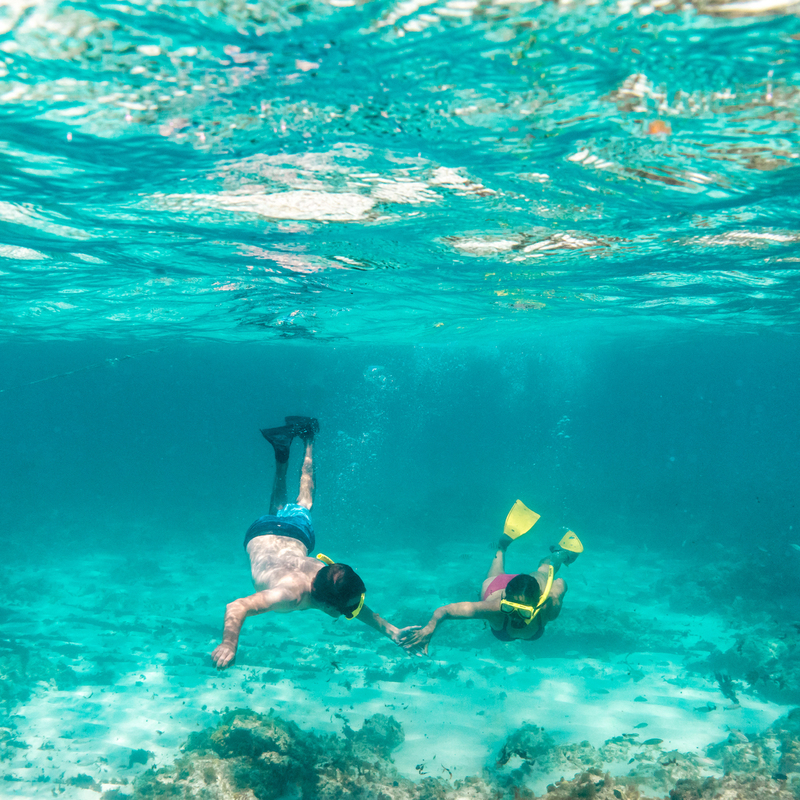 Possible detours include a ride to the highest point of the island, exploration of an ancient cave, and a visit to a natural pool known as "Conchi", which is a wonderful place for cliff jumping and snorkeling. On the heels of your exhilarating morning adventure, you'll most definitely want to spend the afternoon in full relaxation mode at H2Oasis, Aruba Marriott Resort's glistening adults-only pool and bar. With views of lush grounds and swaying palm trees, couples will enjoy cozy cabanas, tropical cocktails, and plenty of poolside lounging. Meanwhile, if it's Thursday night, the carnival dinner at La Vista restaurant is not to be missed. Following a tasty grand buffet dinner, guests will be treated to a lively carnival celebration out on the terrace, which also overlooks the sea. This high-energy celebration features colorful costumes, contagious music, and delightful dancing. End the day by visiting MooMba Beach Bar, a colorful bar known for its two giant palapas. Be sure to order a local Balashi beer or sample from their signature cocktail menu. The Aruba Ariba is a favorite, made with vodka, rum, triple sec, banana liqueur, and fruit punch. Spend the morning kicking back on Palm Beach beneath the shade of your own palapa. After a relaxing walk down the beach, it'll be time for a swim in the calm, aqua blue water. Equipped with a cozy seat, incredible weather, and premium views, we'll understand if you'll never want to leave the sand. Steps away, Waves Bar & Grill is a terrific spot for lunch thanks to its early happy hour menu and postcard-perfect view. While enjoying a sandwich or salad, you'll have an up-close vantage point of the action along Palm Beach, from catamarans sailing off in the distance to stand-up paddleboarders making their way down the shoreline. For the afternoon, head to downtown Oranjestad for a leisurely stroll around Aruba's historic capital. Known for its colorful, historic buildings and traditional Dutch architecture, this lovely city also provides endless shopping options, whether it be high-end stores like Gucci and Louis Vuitton or boutique shops for one-of-a-kind gifts. Cap the night with an elegant dinner at Ruth's Chris Steak House, located inside the Aruba Marriott Resort. For a sweet treat, don't miss nearby Gelato & Co. for a taste of delicious Italian gelato, which is always made from scratch using natural ingredients. 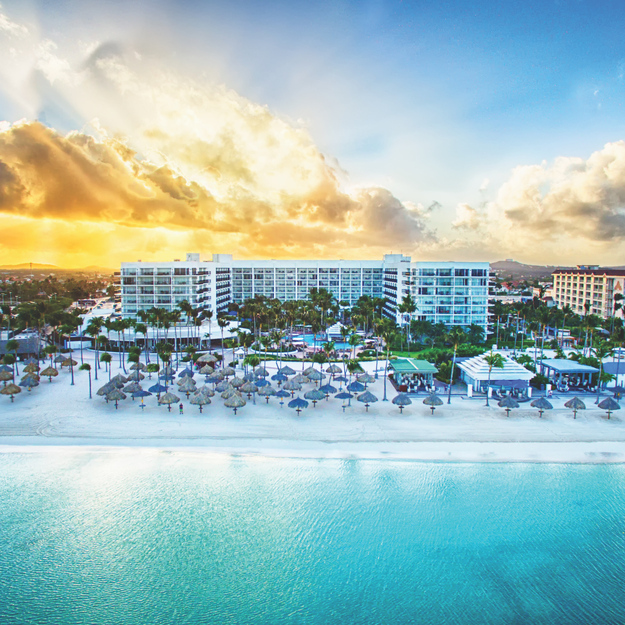 In 2019, Traveler's Joy will be giving one lucky couple a FREE honeymoon to Aruba Marriott Resort & Stellaris Casino. To enter, couples simply need to add the Aruba Marriott Resort Instant Registry as their honeymoon registry for travel between May 1, 2019 and December 20, 2019. The Instant Registry can be found within a couple's Traveler's Joy account (simply click on "Add Suggested Item" to get started). Read the Terms & Conditions for this sweepstakes here.